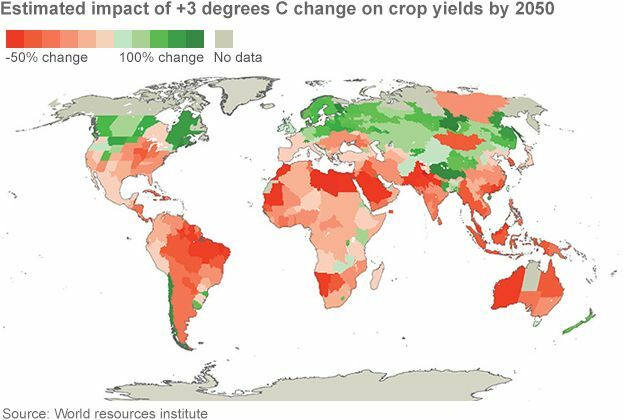 Below is a significant global map with immense ramifications. Climate refugee mass migration routes can be deduced. 2*C. A number that has acquired the significance of the Golden Mean. Nothing of the sort. 2*C is an amalgam of political expediency and scientific doubt. This rootless number is derived from an estimation of global temperature calculated from ice cores over the past 100,000 years. 2*C represents an academic opinion that global temperature should not exceed the upper bound of these records. The 2*C limit is therefore a published political objective that global warming should not exceed 2*C above the global temperature at the commencement of the Industrial Revolution. It is a temperature which reflects the upper global temperatures determined from ice cores during the Holocene Period. Based upon current observations and estimates in the science community, the 2*C limit will be breached by mid-century and perforce, international attention is being given to living in a hotter and more violent climate. The Scientific American (March 2014) published an article by Dr. Mann (N0AA) stating that by mid-2030s, based on estimated fossil fuel consumption, the critical 2*C of warming will be reached. So, the background to the mid-December 2015 Paris Climate Conference is that global temperature above pre-Industrial Level will be breached by 2050. Very disruptive weather events are expected. The deliberations will concentrate on living on a hotter, more violent world, not holding the global temperature below 2*C — this is a pipe dream. The Economist (19 December) under the headline ‘Hopelessness and Determination’ summarised the principal conclusions arrived at by 195 countries. 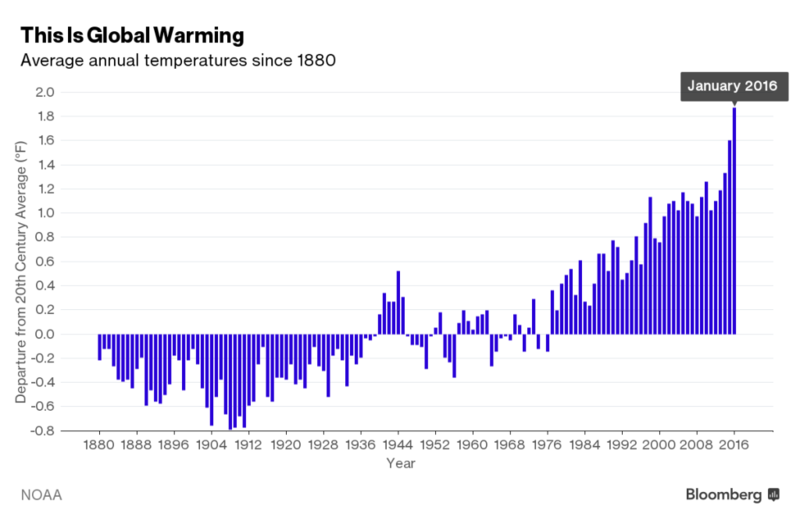 The global temperature must not rise 1.5*C above pre-Industrial Levels. The adopted Climate Agreement cannot prevent a global temperature rise above 1.5*C.
The Agreement (pledges) between the nations “will put the world on a course for something like 3*C of warming”. (The Economist 19 December) This elevated temperature will cause the Greenland and Antarctic ice caps to melt and over centuries sea level to rise by up to six metres. The Nations have agreed they cannot control each others carbon dioxide emissions, and into the foreseeable future fossil fuels will still power national economies. Recognising this fact, the major international pre-occupation will be to reduce the risks of climate change and ensure populations can adjust to a hotter and more violent climate. More international funds will be available to to assist the poorest and most vulnerable countries. A task force will assist those communities unable to adapt and require a new ‘home’. Carbon pricing activities will need to be expanded. Countries are to be encouraged to ‘fight and survive’. This appears to be a clear objective of Wealthy Countries who do not wish to accommodate millions of climate refugees. Wealthy Countries must increase research into clean energy alternatives. To slow the rate of global warming, countries must increase emission costs and accelerate industrial and domestic alternative power adaption and storage for decades to come. Apparently not dealt with was a discussion on the nexus between sustainability, pollution and global warming.The philosophe, F Scott Fitzgerald, once uttered the sanguine comment “Things are hopeless and yet there is a determination to make them better”. By 2050 greenhouse gases will be removed from the atmosphere at the same rate as they are added – 43 giga tonnes. (IPCC est. 2016). There appeared to be no mention of technology or greenhouse gas dilution rates in the atmosphere. A contentious issue administered by the UN Convention on Climate Change has now been modified. Nations were previously required to ‘act in accordance with their common but differentiated responsibilities’ This meant ‘rich’ countries had to reduce emissions while ‘poor’ countries were required to make no reductions. This inconsistency was well illustrated between China and America, both are the world’s largest emitters. donor countries will be ‘policed’ to ensure the voluntary commitments are honoured. The 1.5*C waypoint defined by the Paris Agreement is only a symbol because as a goal it is not feasible since global temperature is forecast to rise above this benchmark. The political class appear now to be taking global warming seriously. The Paris Conference has formalised an oversight forum where national progress in carbon dioxide reduction will be monitored and pledges contributing to the $100 billion INDCs fund checked. All good housekeeping! Lead time estimates for global temperature decline related to a decrease in carbon dioxide emissions. Is Homo sapiens looking at tens to hundreds of years before atmospheric concentrations ofcarbon dioxide start falling? An article in Social Europe (18 February) states that commitments made by the contributing countries will not keep global warming below 2*C by 2100. Furthermore, to bring warming below 2*C, net zero emissions must be achieved between 2055 and 2070. Net zero emissions require all GHG emissions to be buried or chemically neutralised. The technology for this process is not yet available. Scientific authorities warn the searing miasma of global warming will, by mid-century, precipitate the forced migration of millions of thirsty, starving, destitute humans. The IPCC estimates by 2050 more than 200 million people will become climate migrants due to shoreline erosion, coastal flooding and agricultural disruption. Fourth Century. A cold period over many decades forced Huns and Germans to invade Gaul and the Visigoths to sack Rome and destroy an Empire. Eighth Century. Decades of drought in the Middle East forced Muslim hordes across North Africa and into Europe. Seventeenth Century. The fifty year Little Ice Age convulsed populations into survival migrations. 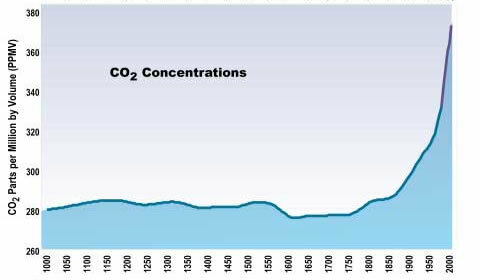 Between 1600 and 1700, atmospheric carbon dioxide concentrations fell from 220 to 180 ppm. By 1850 the concentration had commenced its vertiguous ascent into the Anthropocene. 1998. Floods in Bangladesh and the Yangtze basin required resettlement of 35 million people. The concentration of the many serious global weather events at the commencement of the 21st Century can only be harbinger to more disruptive events. The NASA – GISS image of global temperature between 1970 and 2004 (34 years) permits certain deductions if the temperature trends continue. The high latitudes are heating rapidly triggering concerns over the melting of the Greenland ice cap which, over a century, would raise sea level by a few metres. The Bering Strait region shows an extreme rate of change. Spontaneous methane fires have erupted as the tundra melts and fears have been expressed that fires could spread round the Arctic rim. North-eastern United States and western Europe are still relatively cool. 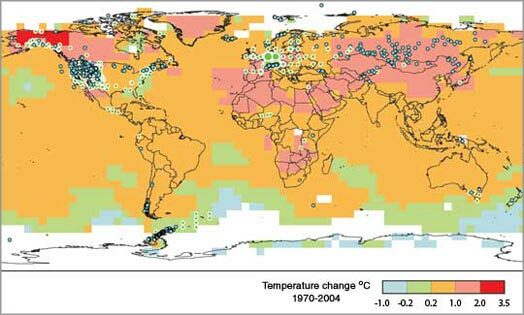 North Africa, Middle East and Asia are indicating a worrying rate of temperature increase. South America, equatorial Africa and south-east Asia (jungle covered) remain relatively cool. Australia is perhaps an aberration- evidence indicates this continent is becoming markedly hotter. Antarctica remains cool with a small rate of temperature change. The above observations are based on data more than a decade old: anecdotal and scientific records indicate trends are continuing. Protecting infrastructure and military installations from sea level rise. Since 1900 sea level has risen by 30 cm round the Statue of Liberty. In Arctic regions temperature is rising fast, fish stocks and food security are at risk and require protection. National security threats are considered to be mass migration, power supplies and storm surges. Weapons systems must be redesigned for use in extreme weather conditions. Europe and Russia will attempt to deny access to millions of climate change refugees from North Africa, Central Asia and the Middle East. Expanding habitable areas may form in Greenland and northern Europe but melting permafrost and methane eruptions may render northern Russia and Canada uninhabitable. India and South-East Asia might become overwhelmed by Arabs, Persians and Chinese, however, declining Himalayan snow may create water shortages. The jungles of Brazil, central Africa and Indonesia/Malaya may not be able to support large numbers of climate migrants. Coastal Australia will experience an influx of Pacific Islands inhabitants’. Becoming the south aast Asian ‘food bowl’ may not be possible. Patagonia, Falkland Islands, South Georgia and Macquarie Island might become bracing retreats for political, industrial and military elites. Antarctica might become a new home for a privileged few. Scenarios that could resemble the above may become apparent as the 21st Century passes the halfway mark. A critical factor for mankind is when carbon dioxide concentrations start to substantially decline. A time frame of at least 100 years should be expected.